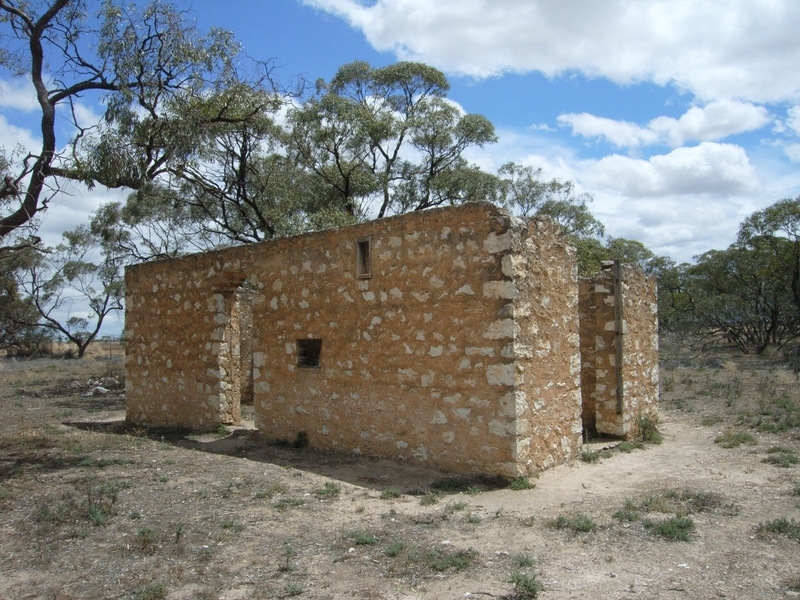 Allotment 2, Parish of Pigick was granted under the provisions of Mallee Lands Act 1896 as a perpetual lease to Annie Wickham on 1 July 1899. In common with many farmer settlers struggling on the marginal land and battling droughts, Wickham forfeited her lease in 1903 and it was subsequently applied for by Mary Holland. Holland?s application was granted at the local Land Board held at Jeparit on 18 February 1904. By 1912 Holland had carried out improvements valued at £395, being the erection of a house, a shed and fencing around the entire allotment. None of these structures survive. In c1904 a Polish family headed by Johann Stasinowsky settled on a farm on the adjacent allotment. Johann and his wife Maria had come to Pella from Wauraltee in South Australia. At some time between September 1912 and August 1913 Stasinowsky bought allotment 2 from Holland. It is believed Stasinowsky built the lime kiln in c1914. 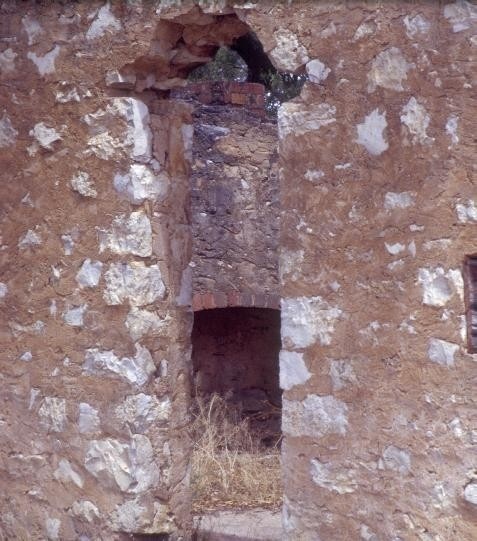 The lime kiln is an example of a ?D? type kiln. It is constructed of limestone with a brick lining, is rectangular in shape and is set in a slight depression in the ground. It is approximately 7m across, 4m deep and 2.5m high. 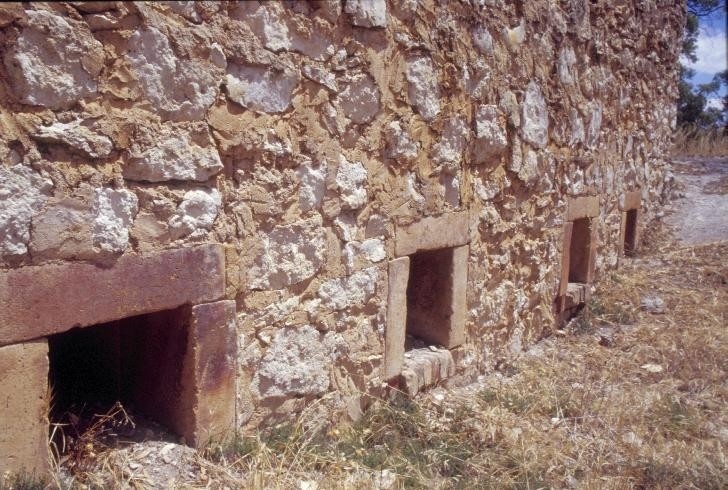 Four brick lined draw holes to ash boxes are located at the base of the front of the kiln. Also located on the allotment are a limestone hut and a remnant chimney. Their construction is similar to the kiln and Stasinowsky probably built these as well. Stasinowsky sourced limestone for burning from the local quarry reserve. The reserve had been excised from the southern end of allotment 2 in 1910. Stasinowsky and his son Alfred built many houses in the Rainbow area, and in 1909-10 built the Pella Lutheran church and manse from limestone obtained from the quarry. 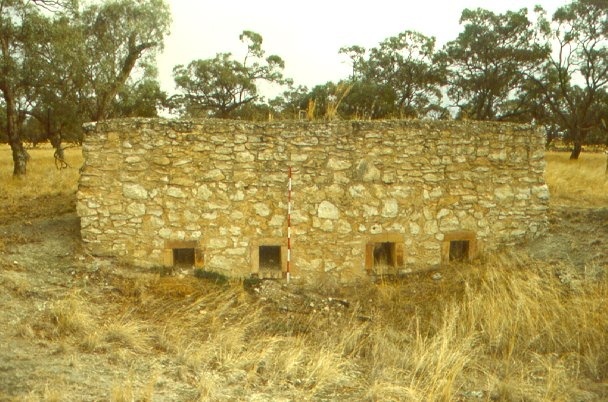 Stasinowsky?s lime kiln is of scientific (technical), archaeological and historic significance to the State of Victoria. 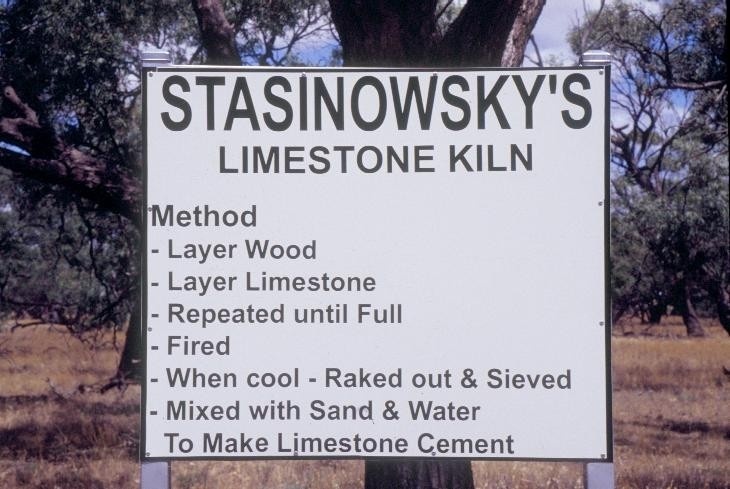 Stasinowsky?s lime kiln is scientifically (technically) significant as a rare example of a ?D? 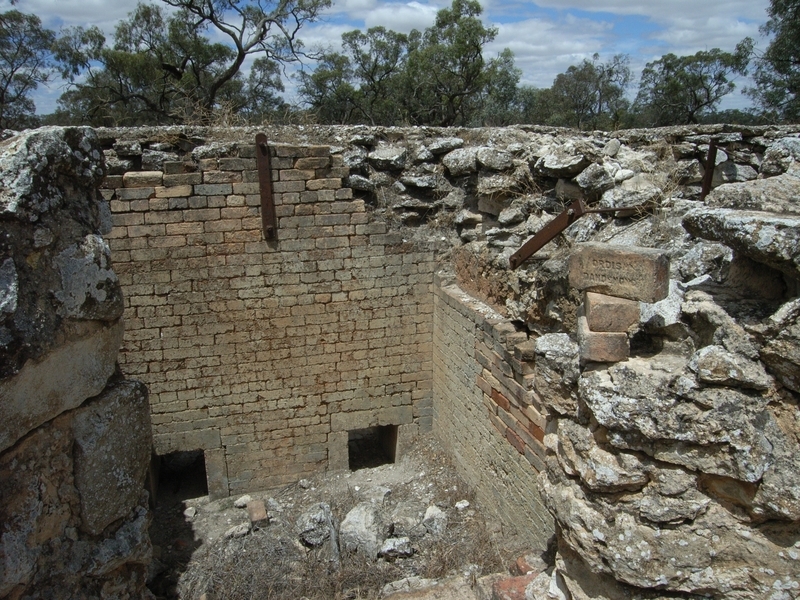 type kiln in Victoria. Such kilns were common in New South Wales during the late nineteenth and early twentieth centuries but very few are known to exist in Victoria. This example is in excellent condition. The site has additional significance for its archaeological potential to reveal artefacts and further evidence of the lime burning process. 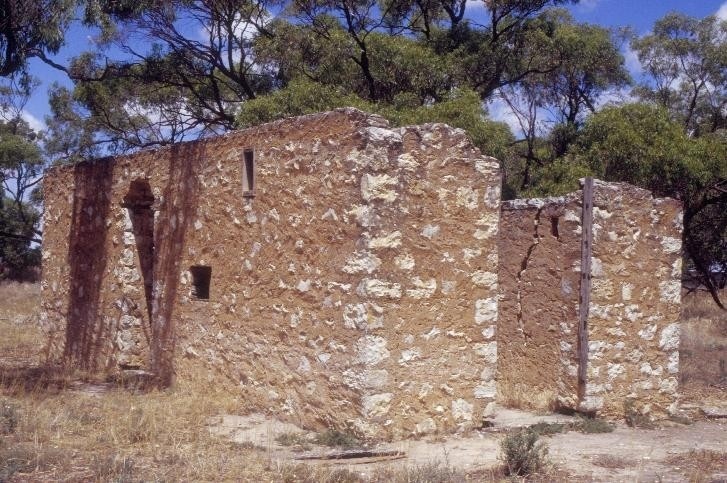 Stasinowsky?s lime kiln is historically significant as evidence of the South Australian migration to the Mallee area of Victoria. It was mainly farming families that crossed the border, but the Stasinowsky family made a significant contribution to the built form of Pella and Rainbow, in particular the distinctive limestone Lutheran church and manse at Pella. 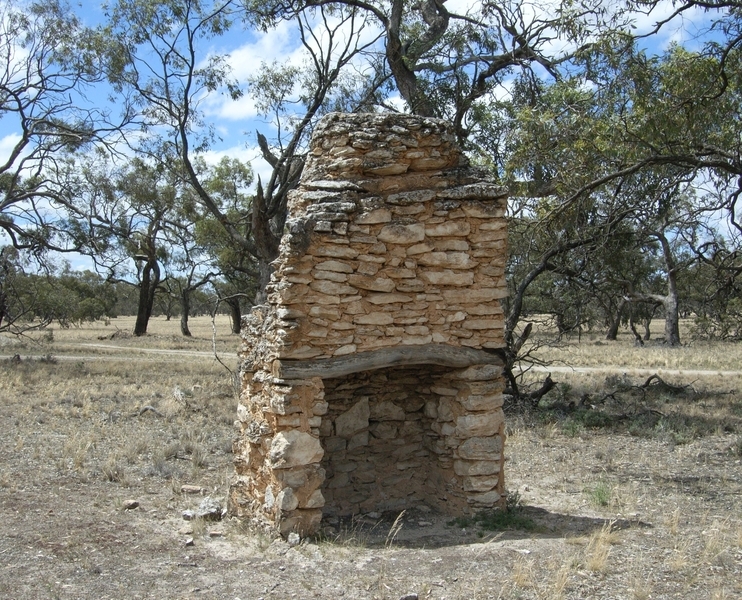 Stasinowsky's Lime Kiln, Allotment 2, Parish of Pigick, Pella, Hindmarsh Shire Council. B1 Lime Kiln, B2 Limestone Hut, B3 remnant limestone chimney. 2. 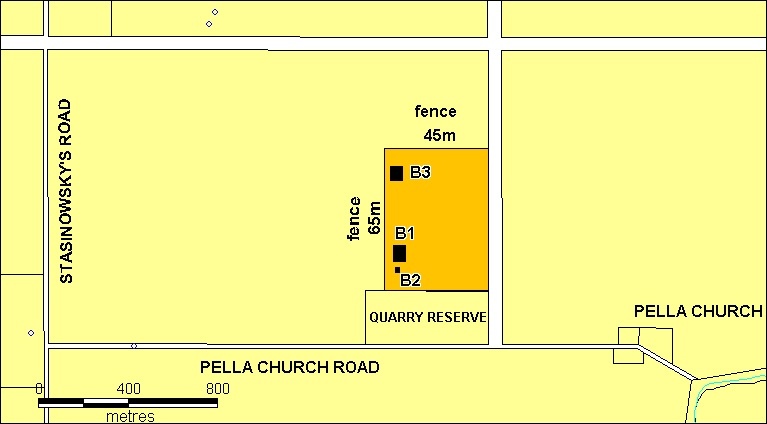 All of the land marked L1 shown on Diagram 1959 held by the Executive Director, being part of Crown Allotment 2, Parish of Pigick. Section 2, Parish of Pigick was granted under the provisions of Mallee Lands Act 1896 as a perpetual lease to Annie Wickham on 1 July 1899. Wickham forfeited the lease in 1903 because she left the land unoccupied and did not pay any rent for 4 years. On 19 March 1903 the Crown Lands bailiff (a policeman based at Jeparit) reported on the site. He reported that a house which had been built there was now pulled down. On 18 May 1903 Alan McKenzie, who owned neighbouring land, wrote to the lands department to complain that rabbit activity on the allotment was not being addressed, and also requested that an outcrop of limestone in the south-east corner of Allotment 2 be reserved as a quarry. Subsequently Mary Holland applied for the lease of Allotment 2. At the local Land Board held at Jeparit on 18 February 1904 her application was granted. Holland was married, and her husband had previously worked a share farm with his father in a neighbouring district. On 13 June 1904 the Secretary of the Shire of Dimboola recommended that land be excised from Allotment 2 as the limestone was of no use to agriculture. Holland responded by complaining that the reserve would eliminate some of the best grass from her lease. In 1910 Holland’s solicitor in Horsham wrote to the Lands Department to say that Mr Holland had died, leaving Mrs Holland with a large family (10 children). He wanted to know why a licence had still not been issued. He confirmed that the whole of the land was used for agriculture and was partly fenced. At the same time it was confirmed to the Lands Department that the survey of the quarry reserve had still not been finished. The surveyor hoped to finish it once floods at Separation Creek had subsided. In February 1911 Holland wrote to the Department to advise she was now living with her brother on his land. A few weeks later she wrote again to confirm that all of allotment 2 was now fenced by wire between four hundred box and pine posts. The Crown Lands Bailiff, asked to report on the allotment, reported on 21 March 1912 that there were two buildings on the site. One, a house, was 30’ x 25’ constructed of iron and hardwood. The second was a shed, 60’ x 30’, constructed of hardwood with a straw roof. He valued all the improvements at £395. On 2 May 1912 Holland paid an outstanding amount of rent totalling £8.11.8 and the lease was finally issued. Henry Lush was briefly involved on the section. He appears to have leased the allotment from Mrs Holland for a short time, but quickly defaulted and subsequently she became the lessee once more. On 6 September 1912 Holland’s solicitor wrote requesting a certificate to show that all rents were paid. He required it as a condition precedent to the registration of transfer of the land. Clearly Holland intended to sell. On 5 August 1913 Johann (John) Gustav Strawinosky wrote to the Department asking how much rent was due on the allotment known as ‘the late Mrs Holland’s’. Sometime between September 1912 and August 1913 Strasinowsky must have bought the allotment from Holland, shortly before she died. A letter from his representative on 29 May 1916 said Strasinowsky was occupier of the land under a purchase agreement with Holland. Whilst the Department did not transfer the lessee in law until 1917, clearly Strasinowsky was occupying the allotment from late 1913 or early 1914. The land passed to Andrew Earnest Stawinsoky in 1920. Johann Strawinosky was a stonemason by trade and he and his son Alfred built many houses in the Rainbow area. Johann and his wife Maria came from Wauraltee in South Australia. The family settled on a farm on Allotment 10 in the Parish of Pigick. Stasinowky built the Pella Lutheran church, manse and school. They later built the Presbyterian Church in Rainbow (I Maroske, The Story of Pella, p 31). * Any activity associated with grazing of land, including fence and gate erection, (and maintenance and repair or replacement), or track maintenance, is permit exempt. The purpose of the permit exemptions is to allow works that do not impact on the significance of the place to occur without the need for a permit. Repairs and maintenance which replace like materials with like are permit exempt. 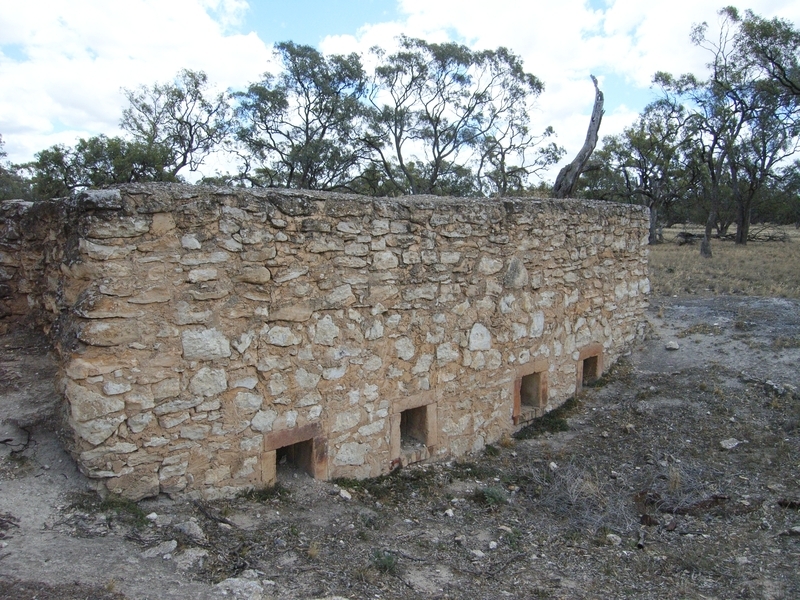 Maintenance of limestone structures requires a specialised approach, and advice should be sought from Heritage Victoria before repairing defective mortar or replacing limestone blocks.